Pimms and lemonade, strawberries and cream, bad weather and yet another disappointment for British tennis; that’s right, Wimbledon is just around the corner. 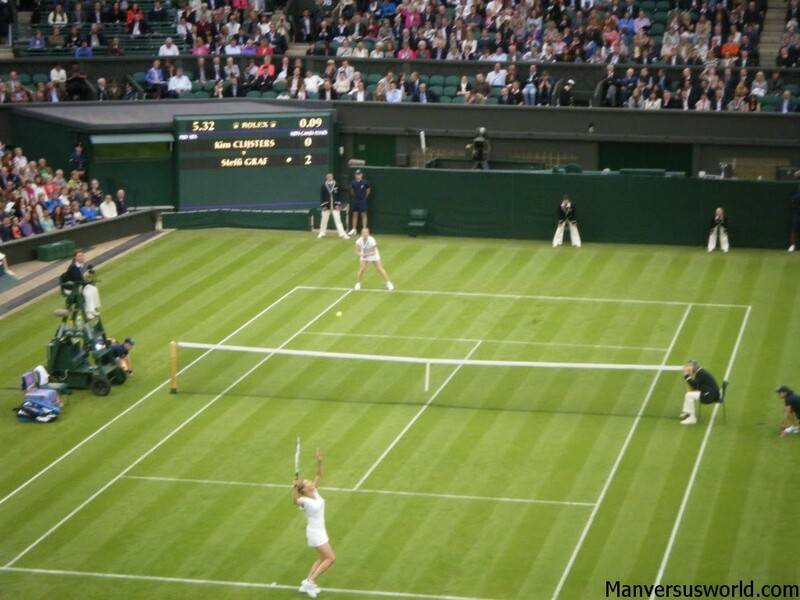 The world’s oldest and most prestigious tennis championship returns to London from 24 June to 7 July 2013, during which time the world’s best tennis players will take to those famous grass courts in SW19 and battle for total tennis supremacy. The media will build up world number-two Andy Murray, only to slate him if he doesn’t become the first British player to win The Championships in more than 70 years, and Americans Venus and Serena Williams will be favoured to win the women’s singles, who have won ten of the last 12 titles. 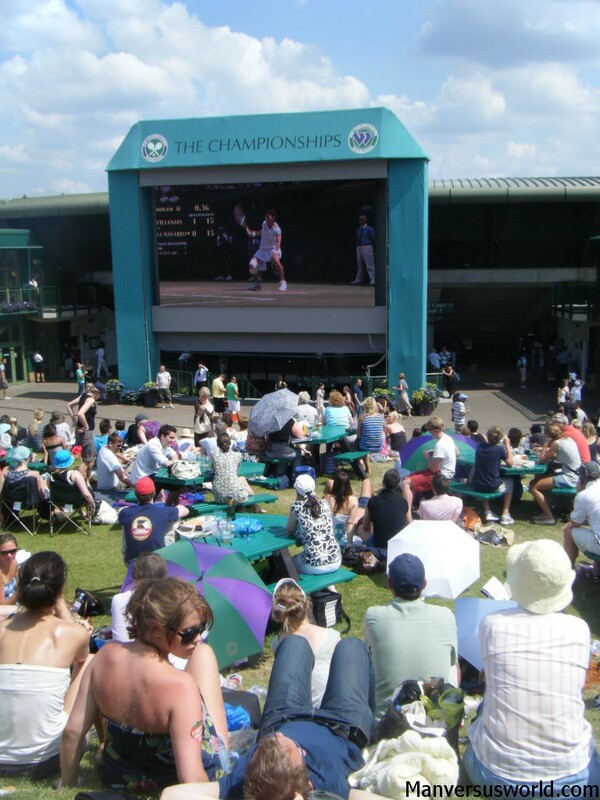 Even non-tennis fans in the United Kingdom will take more than just a passing interest in the British tennis championship, while hundreds of fans camp out for tickets and thousands more queue up every day, but particularly on the middle Saturday of the championships. The smartest and keenest tennis fans get their tickets early, through the championship’s official public ballot, but true Wimbledon fans camp or queue for their tickets. Ahead of the first day of the All England championships and throughout the rest of the tournament Wimbledon Park becomes a “tent village”, as hundreds of keen campers sit and wait to secure one of the 500 Centre Court tickets that are made available each morning. At night, the tent village adopts a lively festival-like atmosphere as campers set up disposable barbecues or get take-away fast-food delivered to the park, mingle with other campers and generally look forward to the tennis. Friendly Wimbledon stewards will tell you when and where you can put up your tent as they hand out numbered queue-cards. 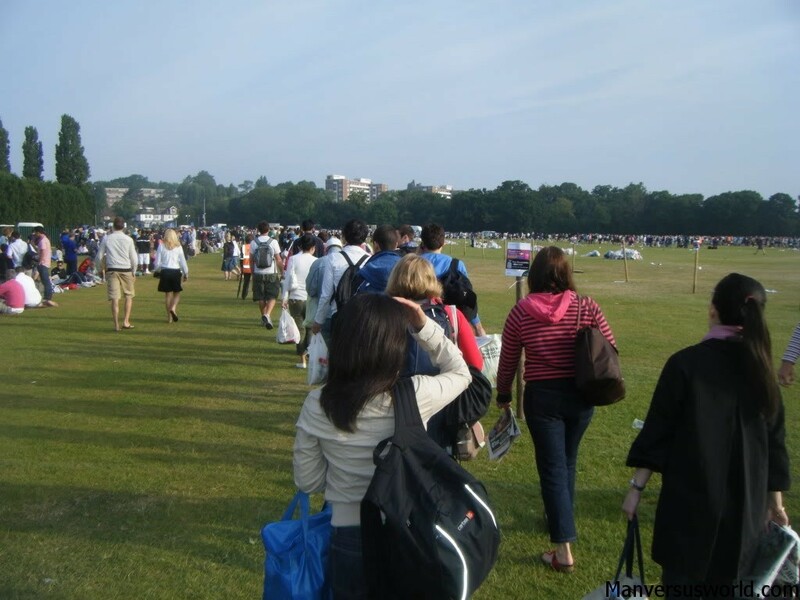 For more information about camping for Wimbledon tickets, visit British Tennis’s guide to queuing overnight. 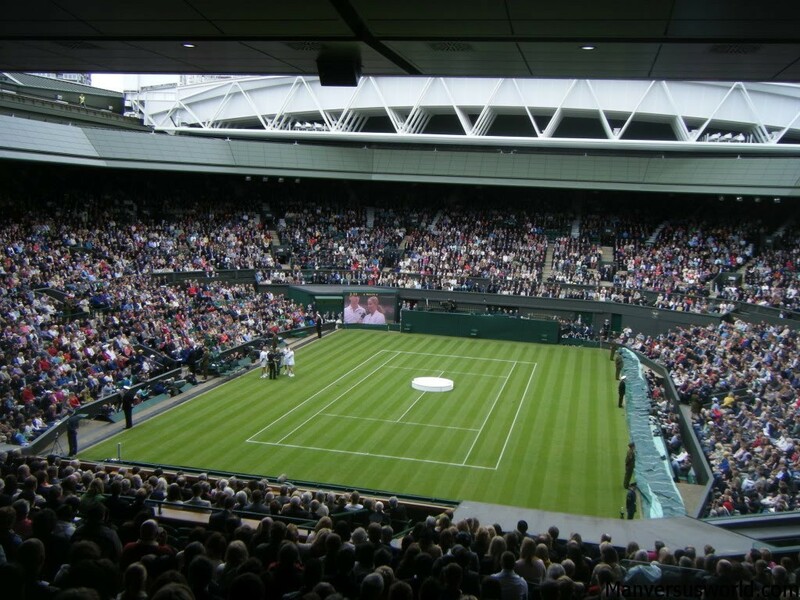 Most fans, however, are content with entry into the grounds rather than snapping up the limited number of tickets into Wimbledon’s showcase courts that are available at the main gate each morning. If that’s the case, then you won’t need to camp out in Wimbledon Park overnight. Join the queue in the morning – the earlier the better – and settle in for a long wait. In the past, a person who joins the queue at around 6am may expect to be in the grounds or thereabouts at roughly 10:30-11:00am. It’s not a fast-moving line by any means but it is an extremely social one, so bring a set of cards with you. Remember also to bring some extra cash for a bacon sandwich, coffee and newspaper while you wait in line. A grounds ticket ensures entry into Wimbledon’s outer courts, where there’s still tons of world-class tennis action, not to mention Henman Hill (actually Aorangi Terrace), a large mound of grass outside of court one where you’ll be able to picnic and watch the big matches on the big screen. Dust off the coolerbag because Wimbledon is one of those rare sporting events that still lets you bring in outside food – and alcoholic beverages. You’re permitted to pack one bottle of wine or two cans of beer or cider per person. 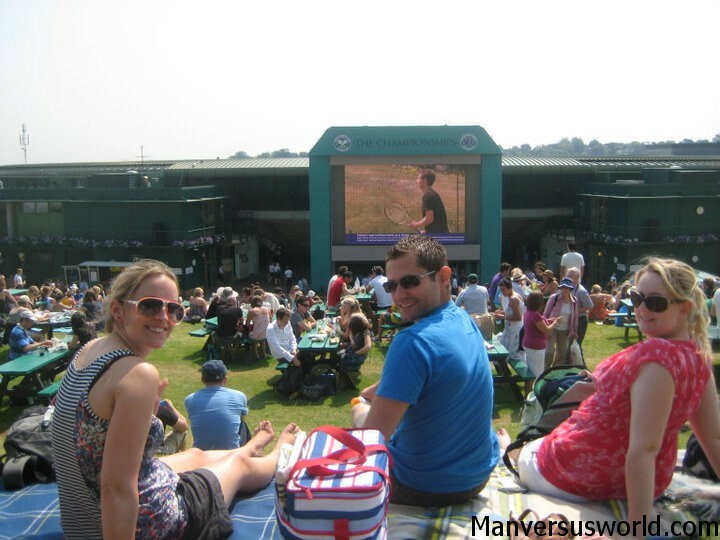 Bring a blanket and secure a picnic spot on Henman Hill – if you’re lucky, you may even manage to snare a picnic table. British weather is famously bad for Wimbledon. However, the middle Saturday during the previous three Wimbledon championships has been sunny and hot. Either way, bring an umbrella; it may even provide shade if it comes to that. You’ll need warm clothing in the morning, depending on what time you join the queue, as well as a change of clothes if it proves to be a rare sunny day in London. Finally, if you’re handed any free food, hats, sun glasses, toothpaste or anything else while you’re waiting to get in to Wimbledon the chances are you will not be able to take it inside the grounds with you due to Wimbledon’s hard stance against ambush marketing, the practice of handing out free stuff in the hopes that it makes it on television. This year marks the first time in three years that I won’t be getting up in the early hours on the middle Saturday and joining the queue for tickets into the grounds – but it’s purely through circumstance. Normally I wouldn’t miss it for the world. One of sport’s proudest championships, Wimbledon is as quintessentially British as mushy peas and complaining about the weather; it’s practically a cultural event. Admittedly it’s the only Grand Slam tennis tournament this intrepid Antipodean ever follows. 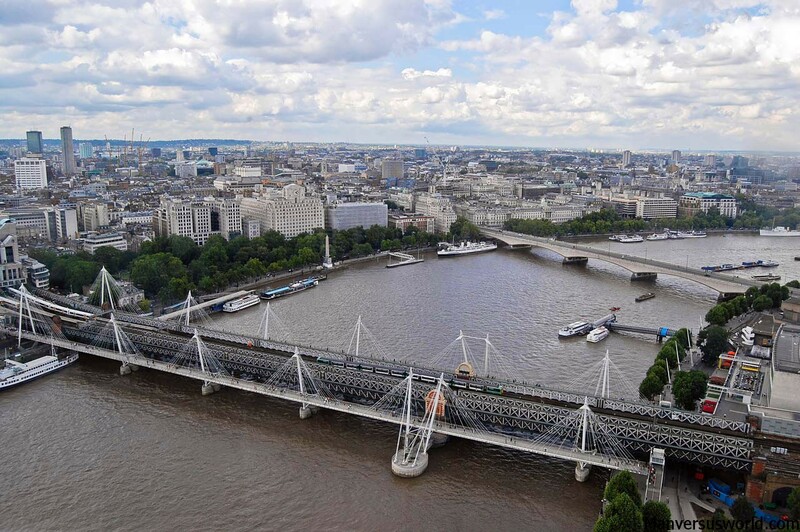 You might also enjoy these top London day trips and my advice for what NOT to do in London. My 18 year old daughter will be going alone. If she queues at 5am, will she have a good shot of getting a grounds ticket for that day? Will she have ANY change of getting a Centre, Court 1 or Court 2 ticket? Thanks! Hey Linda, I’m nearly 100% confident that your daughter will get a Wimbledon ticket into the grounds. And there is a slim chance she might be able to get one for court 1 or 2 (depending on who is playing that day). Unfortunately, there’s probably no chance of getting a centre court ticket at all. Some people camp out overnight to get those tickets. Of course, I only ever went to the tennis on the busiest day (the Saturday) – so I think it’s probably a little bit easier to get a ticket during the week. Hope she has a brilliant time! Hi! I know it has been a while since you posted this article but you seem pretty well informed about how everything works at Wimbledon! I’ll be coming over from Belgium next June and I really want to see Murray open the tournament on the first Monday. I was planning to queue around 5am on Sunday morning but now I’m wondering if I should not better arrive on Saturday night already? What do you think? any advice would be much appreciated! cheers! Hey Kate, my best advice would be to get there as early as possible! Murray is, arguably, the first or second biggest draw card at Wimbledon. If you go in a group you can at least go away for a while and let your friends wait in line for part of the day, and then switch with them. Sorry I can’t be more helpful. But good luck! Let me know how you go! Thanks for your help 🙂 Well I’m going on my own that’s why I’m a bit hesitating as to when exactly I should turn up there. Oh well, I’ll see if they are people around on Saturday evening, if not I’ll go there very early on Sunday! I really like your blog by the way! I hadn’t seen you were from New Zealand at first! It’s actually the next big trip I’m planning! 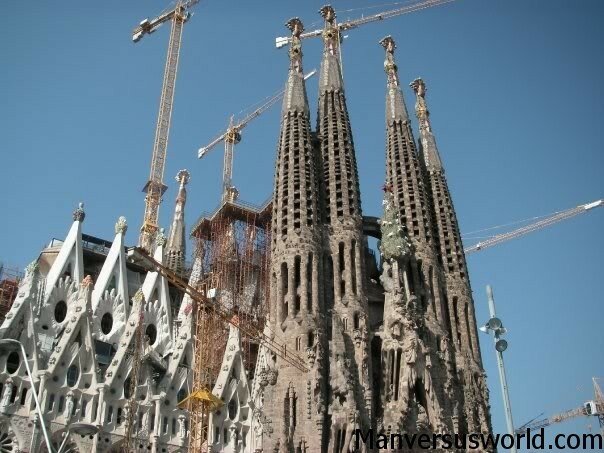 I’ll come over for a few months in November, buy and car and discover the country, really can’t wait to get on the plane! Good luck! Hope you have an amazing time. I always get a bit sad when Wimbledon rolls around because I don’t get to go every year like I used to! And I hope you have an even better time in New Zealand! If my friends and I want to get into the grounds on the second Saturday, will we need to camp out for tickets/if we camp out are we probably going to get tickets? You should be fine just queuing for grounds tickets – so long as long as you arrive reasonably early! If you camp, you’ll have a chance of getting proper tickets into one of the courts.